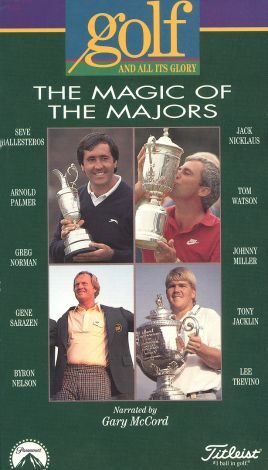 Golf fans can get a star-packed introduction to the most prestigious golf tournaments in Golf and All Its Glory, Vol. 2: The Magic of the Majors. Narrated by Gary McCord, this release travels from the British and U.S. Opens to the PGA Championship and finally the Masters. The setting is completed with a tour of the Royal and Ancient Golf Club. Volume two is loaded with the sport's superstars, including Jack Nicklaus, Arnold Palmer, Lee Trevino, Greg Norman, and Gary Player. Their remembrances are captured in interviews. Archival footage of the PGA competitions rounds out the presentation.